Good morning, good afternoon and goodnight. Iâ€™ve been a member of this forum for a while now, slowly watching by the sidelines, looking at some very excellent layouts and gathering lots of information as well as much needed inspiration. 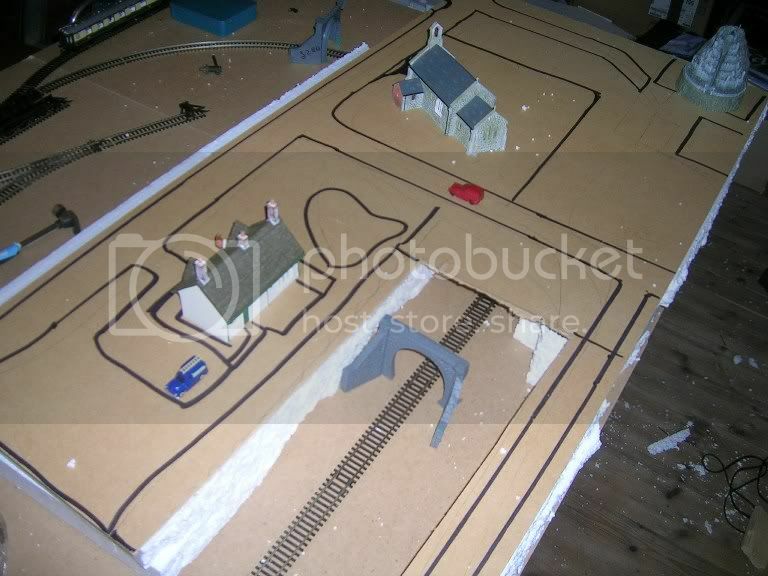 When I joined, I was working on an 11ft x 4 ft, 00 steam era layout. Lots of mistakes were made the whole thing was maybe a bit ambitious for a first layout. However, a house move means Iâ€™m ready to start all over again. 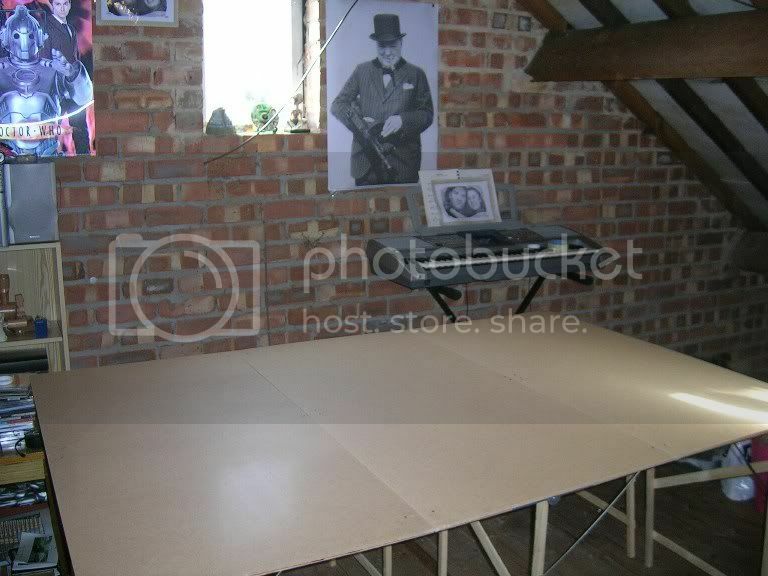 The old layout was scrapped (but track was salvaged) and Iâ€™ve managed to acquire our new loft as a â€œboyâ€™s roomâ€ from the wife and begin planning. The new loft space is huge. Obviously, my first thoughts were to build an even bigger layout, spanning the entire loft but Iâ€™ve opted for a smaller 6ft x 4ft layout. It consists of a simple oblong with a few sidings in a countryside surround. There will be an incline at the back, heading towards a tunnel. 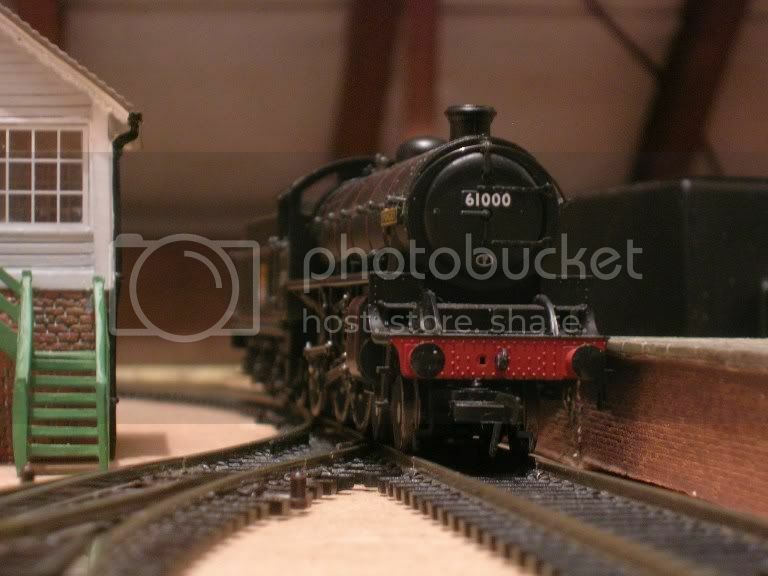 Iâ€™ll be sticking with the 00 scale and with the steam era in general. With this less than epic scale, I hope to gain a lot more experience in terms of weathering, scenery and pretty much everything else coupled with aspirations of larger layouts in future. 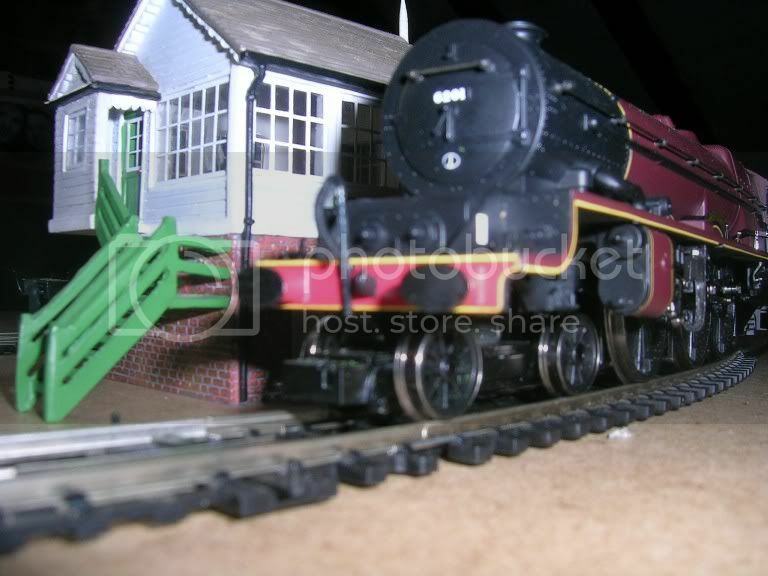 The Princess Elizabeth passes the signal box; the driver is concerned no one is manning the controls. After my finger had an unsuccessful fight with a saw, a trip to A & E stops play for the week. Iâ€™ll come back with regular updates as and where possible (when the finger has repaired itself) and look forward to your thoughts. Last edited by bombadillic on Sun Nov 15, 2009 1:06 am, edited 1 time in total. Long-term sufferer of Railway Enthusiasts Disease. Donations welcome. Wow wasnt expecting a sudden halt there! 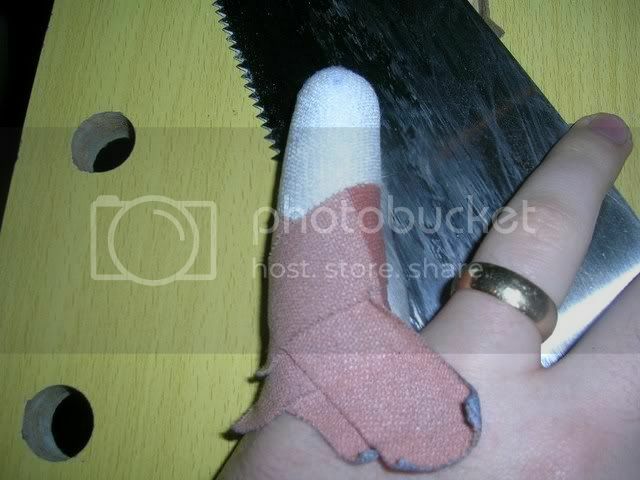 It looks good (the layout), hope the finger gets better soon. While it recovers gives you more time for spendng . I wasn't expecting it myself but must have just got over excited. Ah well, I've got more time to plan, day dream and as you rightly point out, SPEND! Hope the finger heals quickly. Good news, I've got the day off work tomorrow and the bandages are coming off so expect a few updates over the weekend. I'm hoping to get some landscaping done tomorrow. Well, I promised some updates over the weekend so here they are. The bandages have been removed from my finger so Iâ€™m free to roam the modelling world once again. After a trip into town on a day off, I stopped at a local trade merchant for a big, thick piece of polystyrene. I originally went to B&Q who said they didnâ€™t sell any, I was really surprised. I must have walked round about 5 times! Anyway, I ramble on. 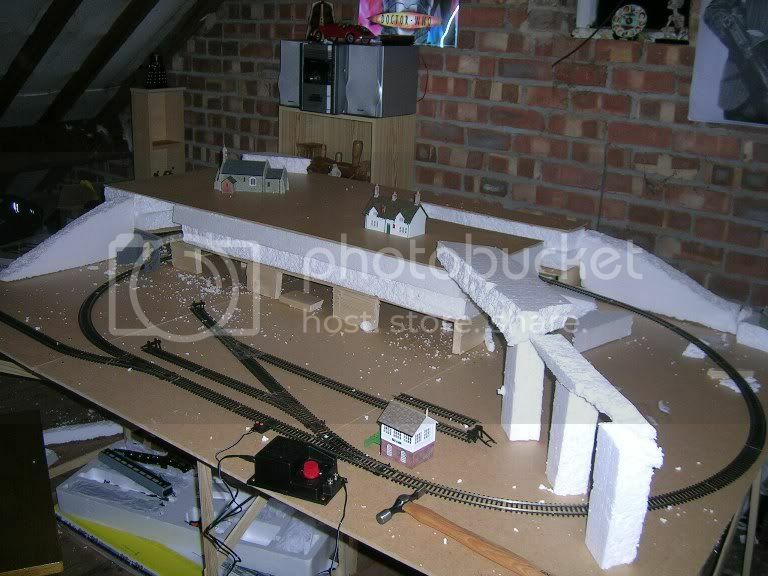 Iâ€™ve started landscaping some of the layout, creating tunnels and a higher level for some scenery. Here are some photographs hot off the press! 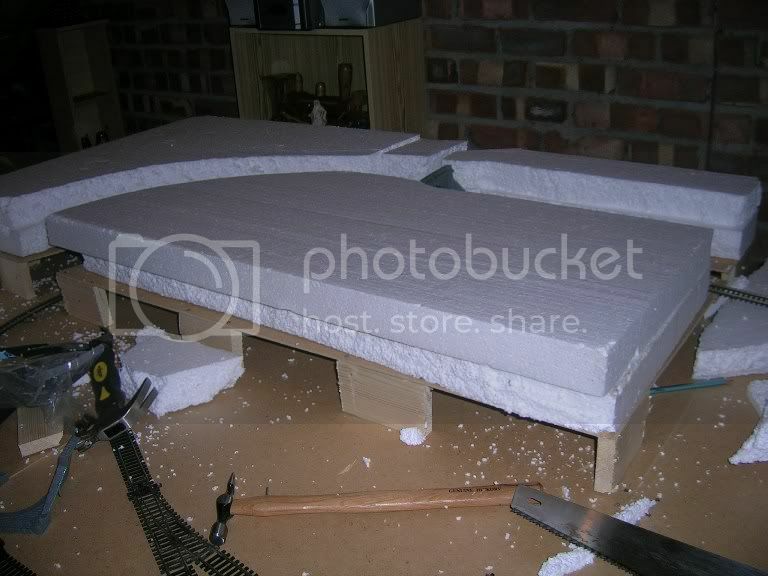 With two bits of polystyrene laid on top of the previously build supports, the higher level takes shape. 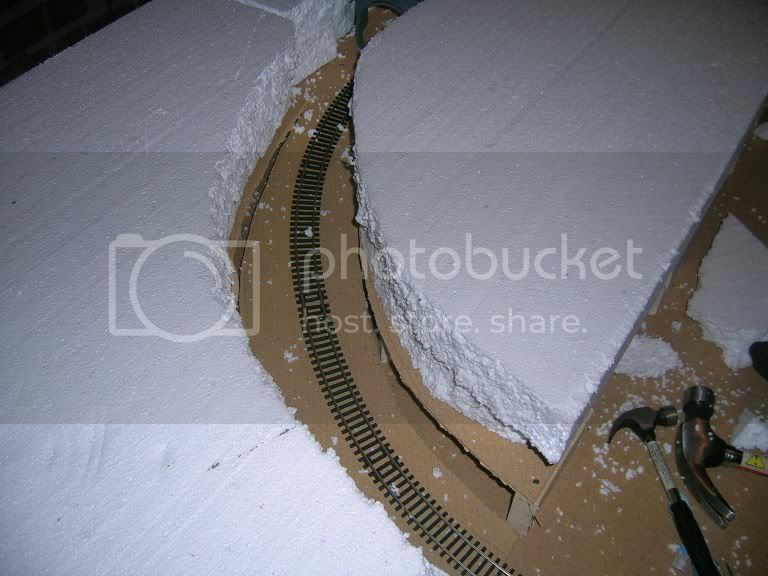 A look at inside the tunnel, the polystyrene will be covered to finish it off. 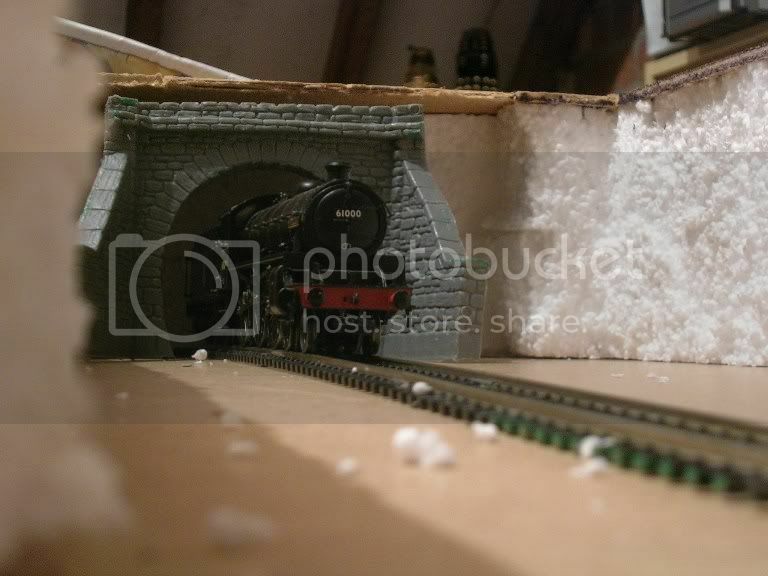 A birdsâ€™ eye view of a tunnel entrance and the thin layer of wood covering the polystyrene to create my tunnel and scenic platform. 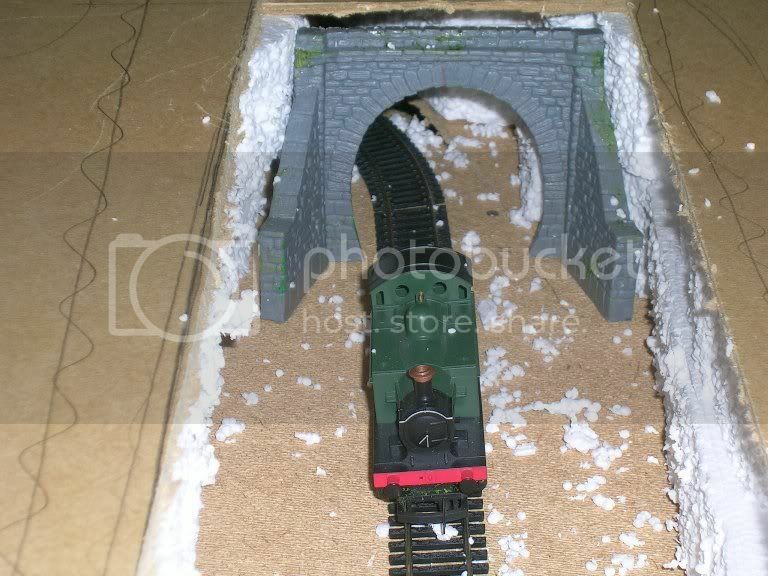 A closer look at the tunnel entrance, the loose polystyrene will all the cleaned away I promise. You can probably already seen pencil markers for planned scenery. 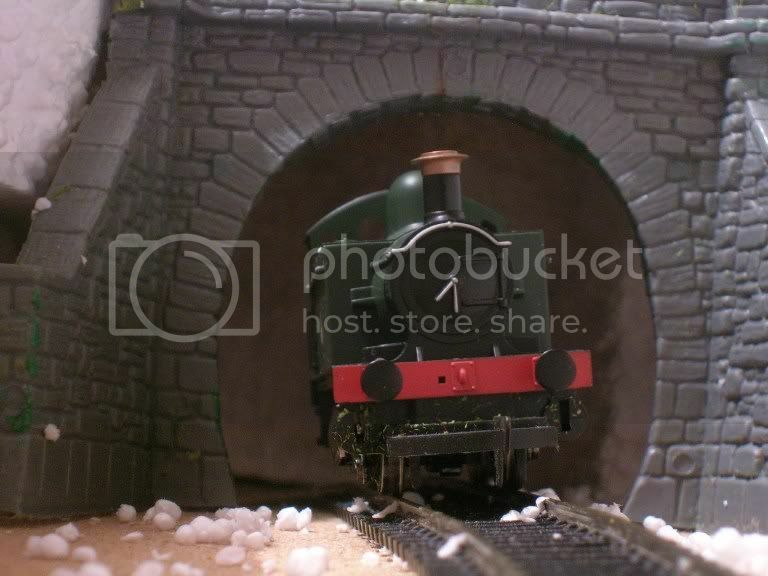 An eye level view of the train emerging from the tunnel. 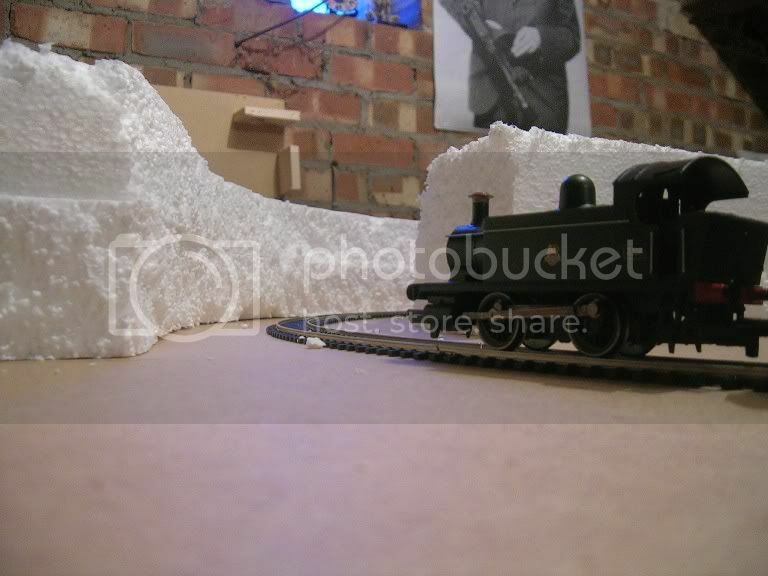 Iâ€™m very pleased this picture and considering our recent snowy conditions, I found the loose polystyrene quite topical. 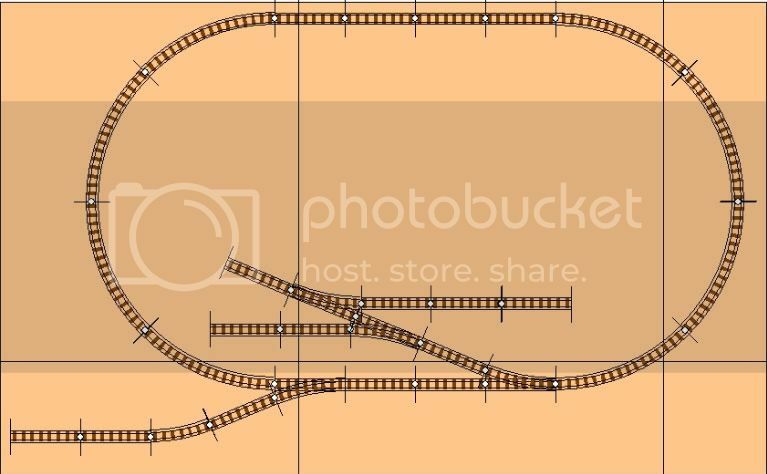 A look at the whole layout. I hope this gives you some idea of the final design. Some of the levels arenâ€™t final so donâ€™t worry some of it looks to high or steep. The bridge over the track certainly wonâ€™t be that high up. And thatâ€™s it for now. I plan to get more done this weekend so keep you eyes peeled and please, if you can think of any useful tips of suggestions, let me know. Bed time, going to a wedding tomorrow. Last edited by bombadillic on Sun Nov 15, 2009 10:24 pm, edited 2 times in total. That looks fantastic! Oh and glad to hear the war wound is on the mend BTW. I'm interested in your incline, i've been advised that unless i use almost a full oval i could only look at a max of about 1/2 inch of height (1 and 1/2 if i use almost all of an oval.) Apparently due to steam locos not having much traction. 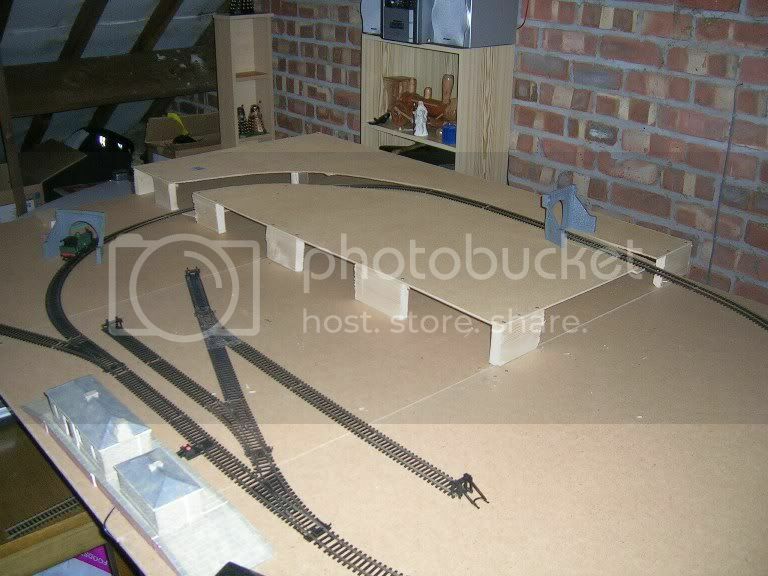 As i'm building a 6x4 aswell i'm always on the lookout for ideas and i would really like to try and use an incline if possible. The advice on this can be seen on my build thread in my sig box if you are intersted. I'm just gonna have a whisky to try and get rid of this green tinge from my face that has come on after comparing my pics with yours, is it envy or just outright jealousy??? Naturally, didn't tell work. But it was quite embarrassing explaining to the nurse how this injury came about. At the time she asked "been doing a lot of DIY?" 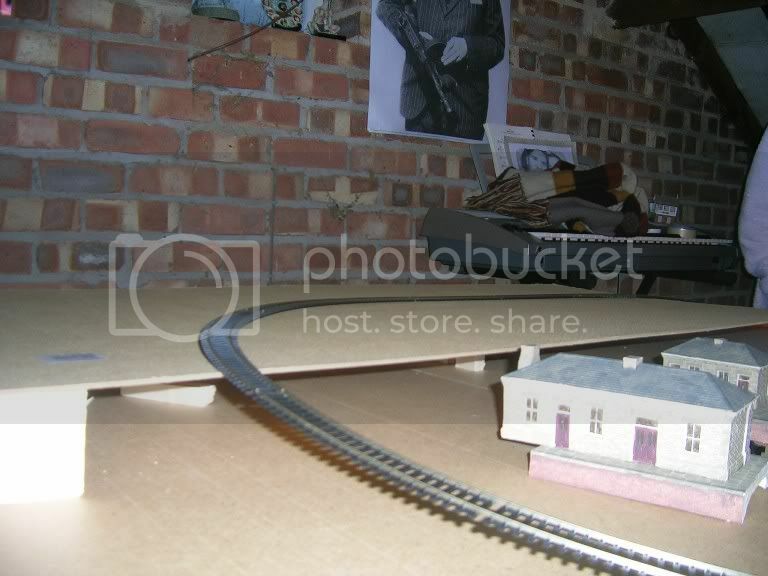 and I said "I've actually been building a model railway." With hindsight, should I have just admitted to DIY? Last edited by bombadillic on Sun Nov 15, 2009 10:25 pm, edited 1 time in total. bombadillic wrote: After a trip into town on a day off, I stopped at a local trade merchant for a big, thick piece of polystyrene. I originally went to B&Q who said they didnâ€™t sell any, I was really surprised. I must have walked round about 5 times! Thats odd, my local one sells loads of the stuff. Not cheap though. About Â£14 for 3 big thinish pieces. Can I offer some advice.. I can see no reason for it other than to go up a bit then down. you don't seem to be needing to go up to get to a raised section or for one track to cross another. I suggest getting rid of it coz invariably when i read things about inclines it is because such and such a train does not pull 3 coaches up it, or this train's wheels slip. mumbles wrote: Can I offer some advice.. 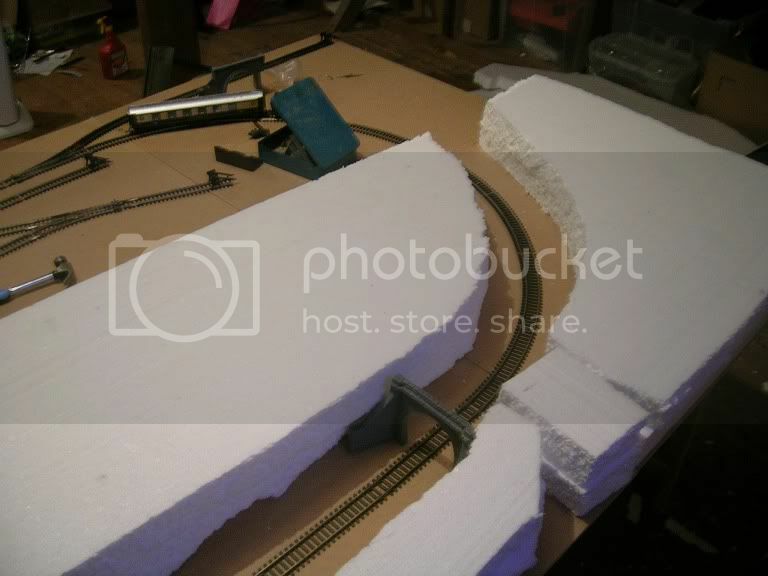 Thanks for the advice Mumbles, I'm doing some work on the layout later so may have a play around with the incline. I can access it at the moment from the back in case of derailments but as you say, may be easier to elimate this possibility all together. Those rough edges on the polystyrene will sand smooth quite nicely,its a messy job but the finish you can acheive is very pleasing. If you sand the inside of the tunnel then it mkaes it very easy to slap on some black paint and make it nice and dark in there. Well, itâ€™s been a very busy day on the layout. Following some advice from Mumbles, I decided to remove the incline and just have a straight tunnel. So after cutting some wood and cutting up more polystyrene, weâ€™re all on one level again. 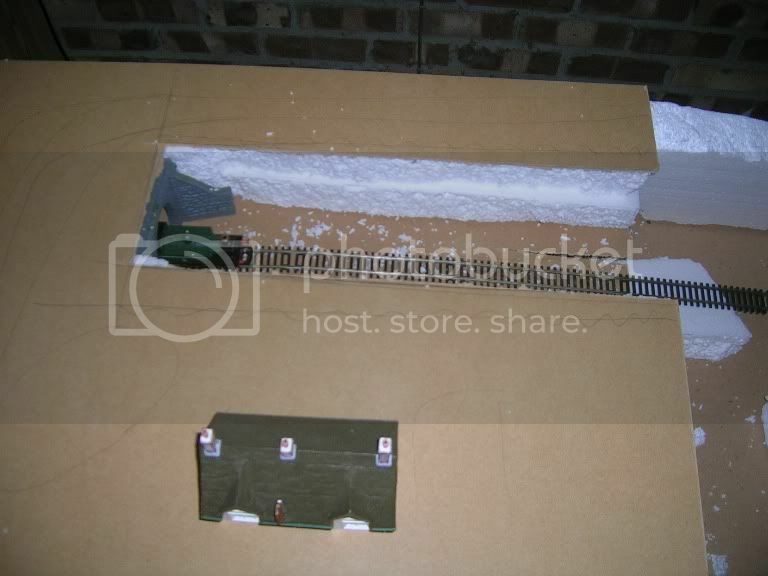 Iâ€™ve soldered the power pack to the track to hide nasty wires and Iâ€™ve begun to plan the layout for scenery. 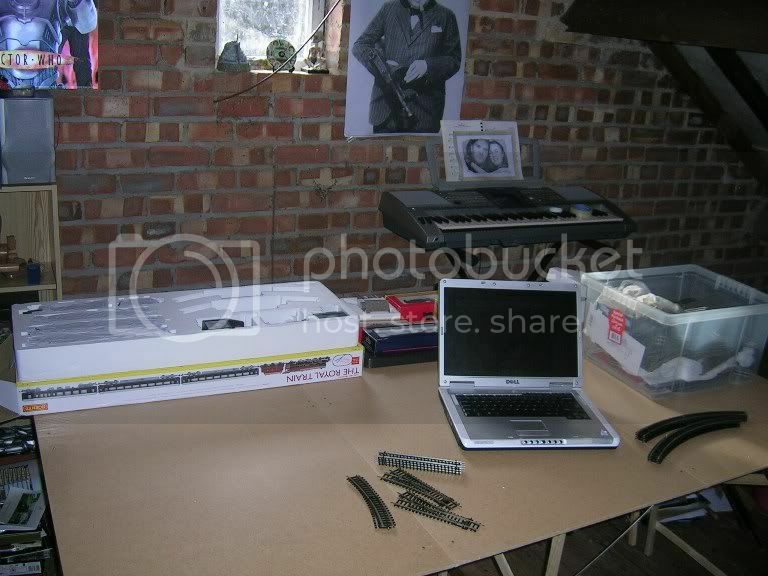 Here are photographs from todayâ€™s work. 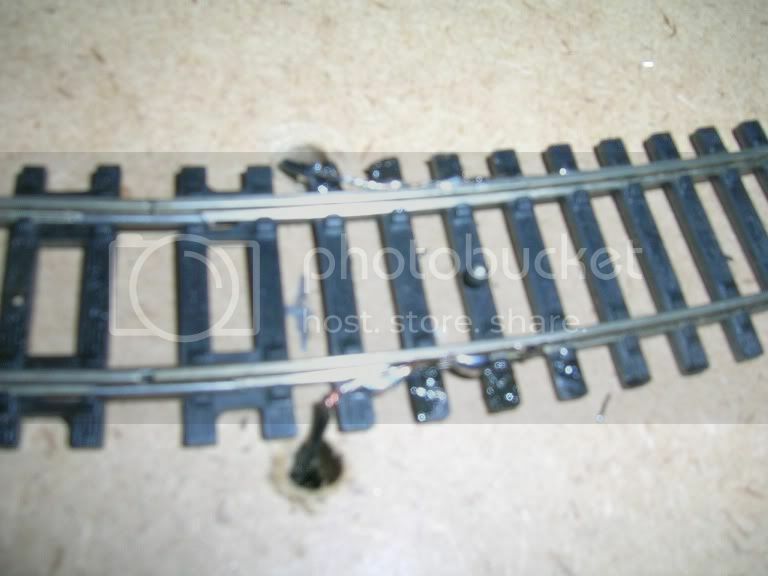 Not the best picture but here is some soldering for you, the trains were most pleased that they could move again. The layout of Lodge Valley village. The city of Minas Tirith will not be a full time resident once the layout is â€œcompleteâ€. B1 61000 â€˜Springbokâ€™ exits the new tunnel. The Daleks, masters of Earth, survey progress in the background. 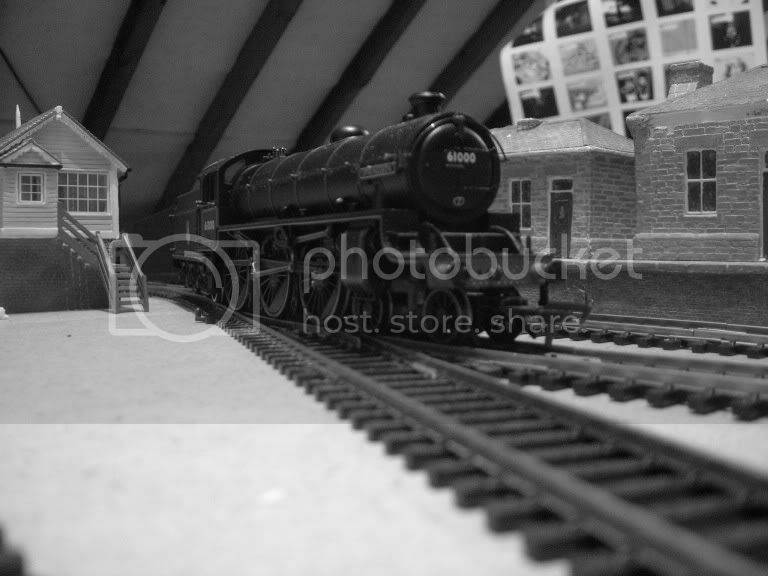 Since there was no one waiting at the station, â€˜Springbokâ€™ pulls into a siding in black and white (oooo, steady now). 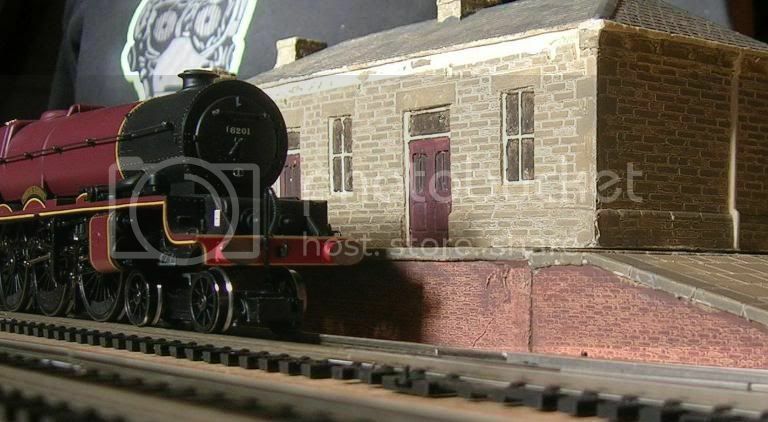 More to come over the week, I won an item on eBay today for the layout so Iâ€™ll take a nice photo to show you all once it arrives. Last edited by bombadillic on Sun Nov 15, 2009 10:27 pm, edited 1 time in total.